The specific epithet dilatata is the Latin meaning "dilated," in reference to the dilated base of the labellum in this species. DESCRIPTION: Plant glabrous, arising from a cluster of fleshy, thickened roots, 10-90+ cm tall. Leaves 2-5, lanceolate to elliptic-lanceolate, gradually reduced to linear-lanceolate bracts higher up on the stem, 5-25 cm long and 1-6 cm wide, ascending. Inflorescence a loose or dense raceme, 10-70 flowered; flowers snowy white, each flower subtended by a lance-linear, acuminate bract. Lateral sepals lanceolate to elliptic-lanceolate, 4-8 mm long and 1.5-3 mm wide, spreading to reflexed, colored as flowers; dorsal sepal ovate, 3-6 mm long and 2-4 mm wide, connivent with petals over the column, colored as flowers. Petals lanceolate to linear-lanceolate, falcate, 3-8 mm long and 1-2 mm wide, connivent with the dorsal sepal over the column, colored as flowers. Labellum linear-lanceolate and abruptly dilated at the base, obtuse, 5-10 mm long and 2-5 mm wide, colored as flowers, base of labellum with a +/- clubbed nectar spur projecting behind, 5-10 mm long. 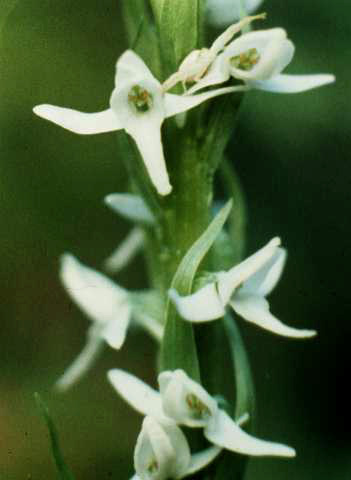 SIMILAR SPECIES: Platanthera dilatata is easily confused with P. hyperborea. This problem is exacerbated by the fact that the two hybridize freely, and produce intermediate offspring. Specimens that are not easily assigned to either one species or the other are probably introgressants, and may be impossible to determine. Representative specimens of the two taxa can be separated by the shape of the labellum, which is strongly dilated at the base in P. dilatata, and only weakly so in P. hyperborea. 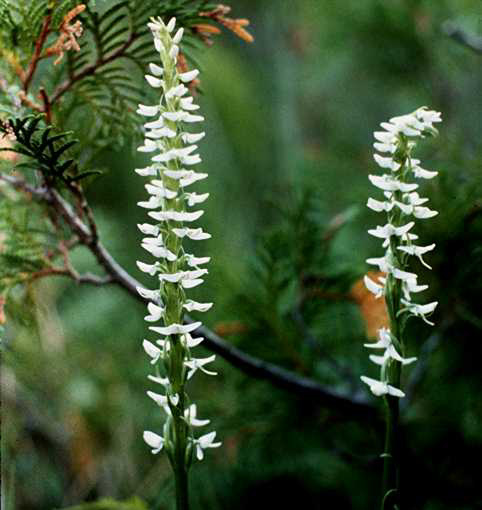 HABITAT: Platanthera dilatata has a preference for circumneutral soils, and is usually found in Thuja bogs and fens. It is also occasionally found growing in more acid situations in bogs. FLOWERING DATES: June 25-July 15. POLLINATION: Kipping (1971) observed noctuid moths pollinating Platanthera dilatata var. leucostachys in California. Since variety leucostachys differs from variety dilatata only in the length of the spur (loner than the labellum in variety leucostachys, shorter than the labellum in variety dilatata), it is likely that noctuids also pollinate P. dilatata in Wisconsin.